Three Steps to Finding an Internship in the U.S.
International students studying in the U.S aren’t just interested in getting an education – many are also interested in gaining practical work experience. As an international student, an internship is a great opportunity to understand the work culture in the U.S. and compare it to working back home. 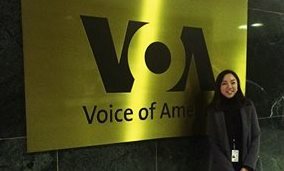 I completed my internship at Voice of America (VOA) in Washington D.C. earlier this month. As an intern for the English web desk, I was responsible for writing some news stories and blogging in English – including writing many of the blog posts you’ve been reading here over the past few weeks! Like many international students, I wanted to take what I learned in class and apply it to real life work. I was able to do that by writing weekly stories, and working with my supervisors and editors to improve my writing. Overall, I had a really great experience at VOA. My three pieces of advice for international students who are looking for internships in the U.S. are: know your interests, know the visa process, and be positive. Know Your Interests: Find an opportunity that interests you. To get the right internship as a part of your academic experience, you have to determine what you want to do, and where you want to do it. Find companies or organizations with jobs that interest you, and then apply to the internship position with those employers. Remember, even if you can’t find information about internships at a company, if you are really interested in working there, it can’t hurt to ask. Know the Visa Process: Can international students legally intern in the U.S? Yes! One of the frustrations of being an international student is visa limitations, especially when it comes to working; many student visas don’t allow the visa holder to have a job. But, even with these restrictions, it’s still possible to have an internship. Most international students are enrolled in a U.S. college on an F-1 visa. Under the F-1, they are allowed to intern for a semester using Curricular Practical Training (CPT) – but as part of the CPT, the internship must be related to their major, and thy must get class credit from the internship. If international students want to intern after they graduate, Optional Practical Training (OPT) is the better choice. Students have to apply for the OPT program with U.S. immigration officials; if approved, you can work in the U.S. for up to one year. Be Positive! : When international students start looking for an internship, they made face rejection, which can be frustrating. But don’t give up! Internship opportunities don’t knock on your door – you have to be active in your internship search and meet people. You never know where an opportunity will arise. Jeonghyun Kim is a former VOA intern for the English web desk. She is from South Korea, and is currently pursuing her Masters in Professional Studies in Journalism at Georgetown University.